Air pollution is an alarming global problem and its not getting any better. Latest World Health Organization (WHO) statistics show that pollution increased by 8% during the past five years, causing some 3 million premature deaths per year. Those that live in big cities are most effected. Four of five people living in urban areas (that monitor air pollution), are exposed levels that exceed the WHO limits. Take Mumbai for example. Breathing the air in India’s most populous city for 24 hours is the equivalent to smoking 100 cigarettes! For Beijing it equates to 21 cigarettes. While most polluted cities are clearly in low-income countries, developed cities are not immune to this problem. A French startup hopes to help combat the detrimental health effects of breathing such air with the world’s first anti pollution scarf. 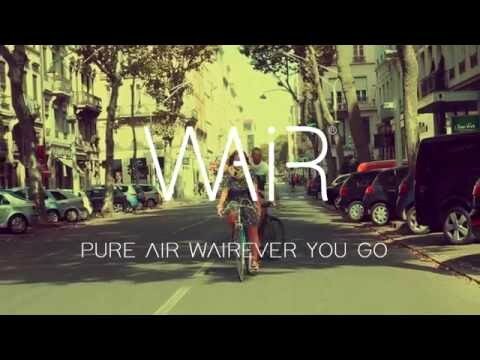 Called WAIR, it was showcased at CES 2017 earlier this year. At first sight, you won’t know there is anything different about this scarf. On the surface it looks like a fashionable garment. Underneath, however, you will find a multilayer filter that blocks 99% of the main toxic components of air pollution. This includes particulates at PM>0.1, such as bacteria, pollen and gasses. Furthermore, the machine washable scarf contains tiny battery-powered fans which generate fresh air. The filters can be changed and it is recommended you do this every 2 to 4 weeks, depending on your usage. There are also sensors inside the mask that monitor the air around you and transmit data via bluetooth to the accompanying smartphone app. This allows you to know if you are in a heavily polluted area, and lets you plan your route through the city based on pollution levels. The app also lets you know when its time to replace the filter. Whether you are a cyclist, a motorbike rider or a pedestrian, this intelligent scarf might become your best friend. There are three designs to choose from, two types of material and a number of colors. Fundraising on Ulule was closed in April last year but you can pre-order on wair. Delivery is set for September.